The Alford Meadows neighborhood on the northwest side of Loveland will become the first neighborhood to have its own public art piece. Residents in the neighborhood are currently raising funds to get “Eagle Fly Fishing,” by Loveland artist Daniel Glanz, installed at the entrance. “We wanted to represent our own and he’s our own,” said Sheree Lambert, assistant to Nancy Brigden, who spearheaded the project. Lambert is co-owner of Shipper’s Supply in Loveland where the sculpture is currently being stored. Glanz is not only a Loveland artist, he is an Alford Meadows resident. 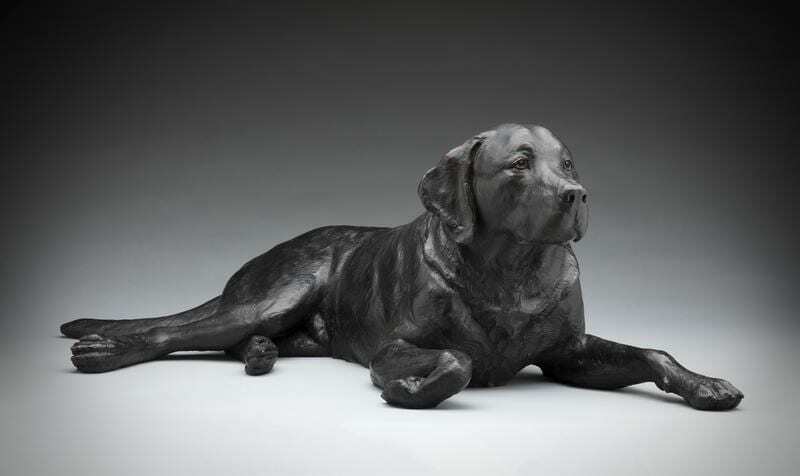 “We are fortunate enough to have a world-renowned sculptor,” said Lambert. Glanz is looking forward to having a piece close to home and will be doing the upkeep. “It’s nice, for me anyway, to have a piece right there,” Glanz said. The piece is the last of an edition that he started about 15 years ago. The eagle grabbing a trout has a wingspan of about 74 inches. 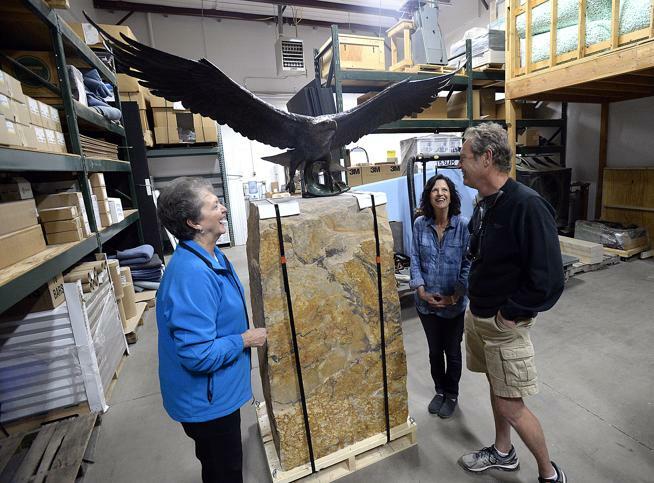 The sculpture weighs about 140 pounds and the stone from Arkins Park Stone in Loveland comes in at 3,000 pounds. “Animals have always been my interest. I have always felt more comfortable talking to animals than people, just ask my dogs,” Glanz joked. The piece has been in a gallery in Vail for a while and when this project came up, Glanz thought it was the perfect fit. “The thing about something like this, is it can inspire different things for different people,” he said. Some may focus on the wildlife where others may see our national symbol. The neighborhood had to have the piece approved by Loveland’s Visual Arts Committee and the piece will become part of Loveland’s public art collection. “This is the first time that we’ve been approached by a neighborhood that wants to fund public art,” said Susan Ison, cultural services director for the city of Loveland. She said she thinks the project could serve as a nice model for other neighborhoods. Alford Meadows will be responsible for the piece placed there. “All the monies for this are coming from private donations and businesses… No money is coming from the HOA association,” said Marlene Thurman, president of the Alford Meadows Home Owners Association (HOA). The donations are tax-deductible and voluntary. “The nice thing about having the residents do it is that they have an investment in what goes into their neighborhood,” Glanz said. The stone was chosen to make sure it would fit in with the monuments that already mark the entrance to the neighborhood. “We already have some very attractive monuments at that entrance of Alford Meadows and this is just going to enhance it,” Thurman said. “There is so much beautiful artwork. Our artists live here, they all live in neighborhoods, and what better way to represent our artists,” Lambert said. The group is currently about 60 percent of the way to the $17,300 goal. The fundraising started in December 2016. The plan is to have the piece installed by August, before Sculpture in the Park and Art in the Park. Funds will go to installing the bronze, landscaping, lighting, insurance, five years of maintenance and to purchasing the piece. “Anyone who is interested in the arts, we encourage it,” Thurman said of donations. The group has already seen a few from outside the neighborhood. If you would like to donate, send a contribution to Alford Meadows Art Fund, c/o 5130 Coral Burst Circle, Loveland, CO 80538.